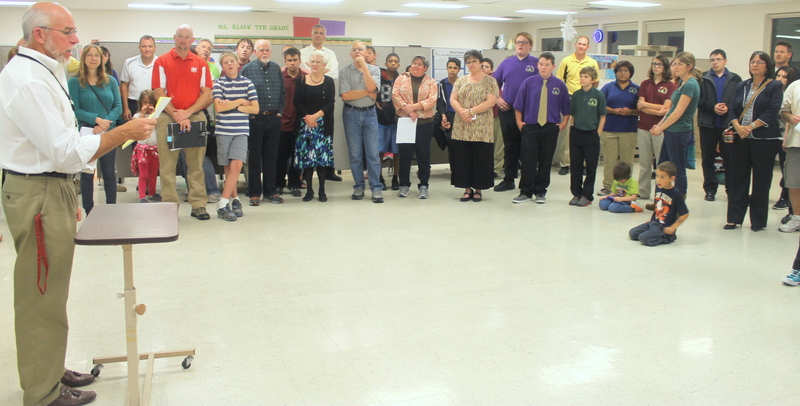 –Project Manager Paul Stephenson speaks to the crowd on PBL Night last week. Thursday evening was not a typical night for the freshmen on campus. For the past month or so, the freshmen class have been working with engineers from Sandia National Laboratories, who presented the task of designing and completing a widget through students’ CAD design courses. The final product was presented to the public on Thursday night. Scholars were given specific deadlines for various aspects of the project, which was cross curricular. They had to write essays about their designs for English class, research the way things function for their physics class, and in their math class they collected data. As the first annual Project Based Learning Night, scholars were excited to present a specific type of learning, where one learns from doing a project or conducting an experiment rather than taking notes or reading a book. There were a few guidelines for the project, one being that the final outcome had to be 8 cubic inches, and something not too complicated or complex to print. Rylee Felzien and her group were one of the three teams that presented on Thursday night. Their product was a six-sided die. Lucas Heimgartner was the head of the operations, and the CAD drawing was done by the group designer, Jacob Molina. “I was the most excited out of my group when we found out that we were one of the three groups presenting on Thursday,” Felzien said. Photo by Hannah Worker -Scholars show off the poster they presented for ASK’s first annual PBL Night. Bock said time management was the main issue they struggled with. “If ASK were to do this next year, I would give the new freshmen some advice: Don’t do it all in one night, this is not a project you can do a one night stand for. Just don’t,” Bock said. Felzien said she wished there had been more organization on the project managers’ end. She said her group had everything done on time, but they did not get their product back from the machine shop until the last minute, and they weren’t told until the day before the final due date that they would have an additional week to work on the presentation. “It would have been nice to know before that, it would have saved a lot of students from stressing out,” she said. 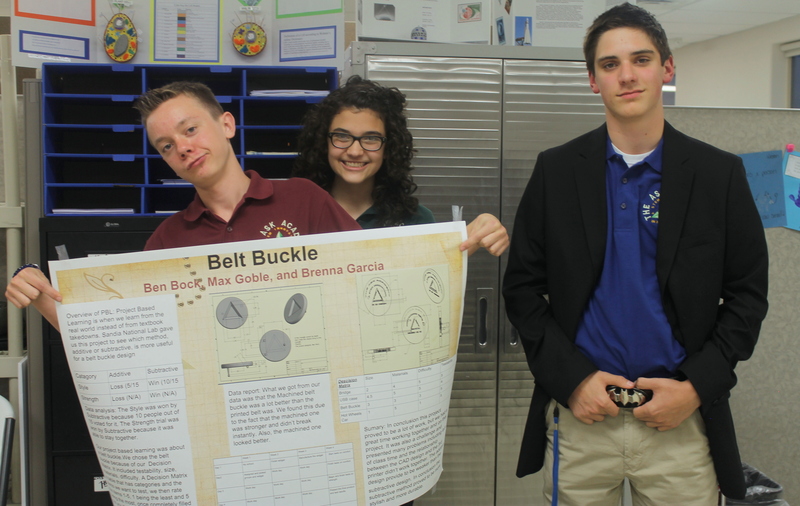 Overall, it appears most freshmen were grateful to experience the first annual PBL Night at ASK.